Every HR department has to deal with paper documents such as employment contracts, payroll tax statements and study agreements: in fact, all documents furnished with a signature. These are often stored in an archive, which makes retrieving them highly time-consuming for your employees. What’s more, checking for the presence of certain documents is not transparent; documents can be lost or incorrectly archived, and in the event of fire or water damage, all the information is irretrievably lost. By digitalizing the processing of HR records with ImageCapture for Documents, the documents are always digitally available and no longer take up valuable archive space. ImageCapture for Documents scans or imports your personnel documents, after which they are sorted automatically or interactively. 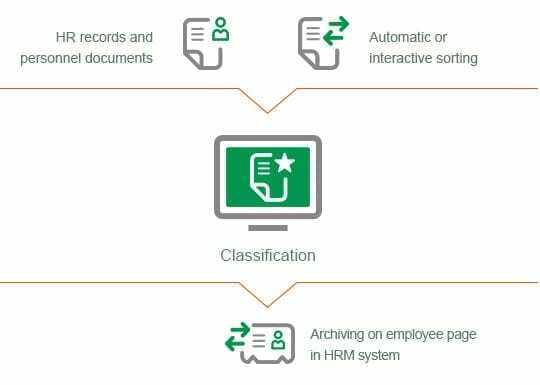 In classifying the documents, ImageCapture uses the selection options from your HRM application, such as employee number and document type. OCR (Optical Character Recognition) technology ensures that the documents are saved in a text searchable PDF format, and linked to the employee screen in your HR system. Your existing files can also be digitalized quickly and easily, linked to the employee’s ID or per document type such as diploma, CV and other HR documents. Internally created documents such as employment contracts, evaluation forms and interview reports can automatically be classified per employee and document type on the basis of barcodes assigned when the document is generated. You therefore manage all your documents in a single location, namely, your HRM application.